Today's article, the second of two parts, focuses on Newark as 'New Jersey's Education City: From Schoolhouse to University City.' By 1884, higher education was on the rise in Newark. By the turn of the century, the city was well on its way to assuming the role of a modern university city. The Newark Technical School, forerunner of the Newark College of Engineering (the present New Jersey Institute of Technology), called 21 West Park St. its first home. Later, it moved west to High Street (King Boulevard), the eastern boundary of its present campus. By 1936, the University of Newark came into existence with the merger of schools, including the New Jersey Law School, Seth Boyden School of Business, Dana College, the Newark Institute of Arts and Sciences, and the Mercer Beasley School of Law. In 1946 the university marked its first decade by merging into Rutgers-The State University of New Jersey. By this time, the Newark College of Engineering had an enrollment of 1,600 students, Newark State Teachers College, located on Broadway, was training 500 teachers, and Seton Hall had selected a building on Clinton Street as its new urban Newark campus. Essex County College was established in 1966. Classes began in 1968 on the easterly side of Clinton Street. The present megastructure at University Avenue and West Market Street opened in 1980. ECC has an open door policy on enrollment which has attracted a student body of 6,000 to the facilities which operate on a continuing 12-month basis. 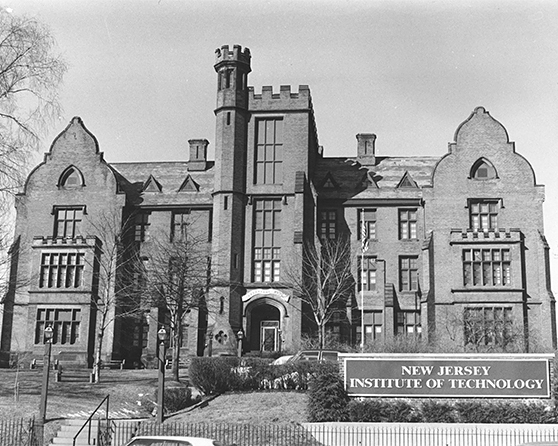 The University of Medicine and Dentistry of New Jersey (UMDNJ) was established in 1970, and changed its name to the one it presently uses, in 1981. Last year, the university's Medical School granted 168 degrees and the Dental School had 75 graduates. The New Jersey Institute of Technology, formerly the Newark College of Engineering, now includes the College of Engineering, the School of Architecture, the College of Sciences and Liberal Arts, and the School of Industrial Management. NJIT's intensive building program has produced a plethora of new structures on the city's skyline. One of the most interesting is the Information Technologies Building, better known as 'The Factory of the Future.' The structure is fully automated and operated by robots and computers. It serves one of the university's basic goals: to develop the technology for computer integrated manufacturing to foster new industries for New Jersey and the nation. Not all of Newark's educational progress takes place at its colleges and universities. The Newark Schools, which came under the control of the state Education Department two years ago, is developing creative new programs for 45,000 Newark students to meet the needs of changing times. Many of the new programs have been developed and are being executed in cooperation with business, civic and cultural groups. Additionally, two private schools, St. Vincent's and St. Benedict's, also have revised their programs, renovated their buildings, and added to their historic facilities with the approach of the millennium. Two new charters schools, North Star and the Robert Treat School, will open in the fall. At the same time, institutions such as United Academy, which has served city children for 40 years, and St. Philip's Academy, a newer addition, continue to serve the needs of Newark children. Construction of the Seton Hall Law School and office tower at Raymond Boulevard and McCarter Highway and the creation of several new research towers built by NJIT in the Central Ward over the past decade or so also are part city's educational explosion. At the Rutgers-Newark 31-acre campus, a research laboratory for the study of the human brain has gone up at University and Warren streets and a new $4 million Institute of Jazz Studies has been added onto the campus library. Presently, Rutgers consists of the College of Arts and Sciences, the College of Nursing and the University College (evening division). It also has a Graduate School of Management, School of Law and Criminal Justice, and Graduate School. After more than 300 years, one of the cornerstones of the city's successes has been its historical and current respect and involvement in education. From John Catlin's 17th century Newark schoolroom to today's College Town section of University Heights, education continues to be a vital part of a rebounding Newark.